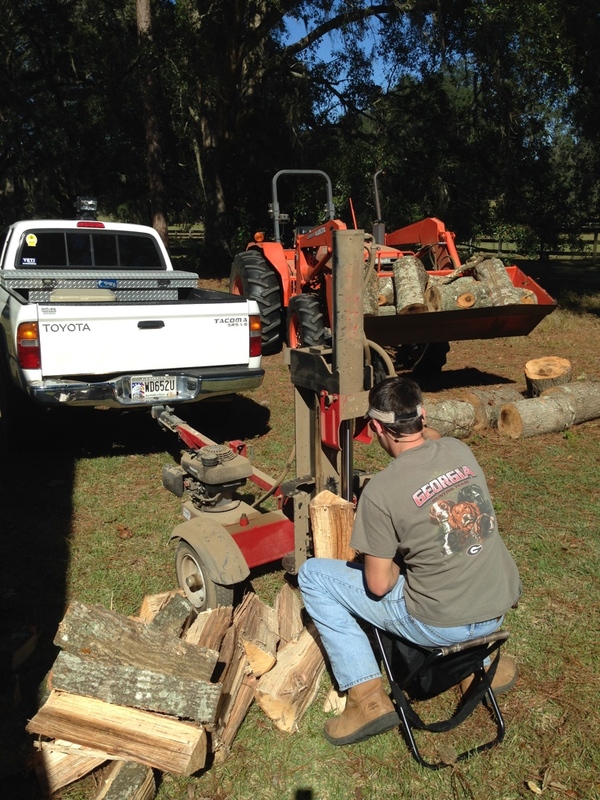 So, besides the feeling of power and glory, compensation issues really, the main reason that I chainsaw is for firewood. On the ground is a Laurel Oak (Quercus hemisphaerica) that we took down because it was growing too close to a Southern Live Oak (Quercus virginiana). Don’t you just love the Quercus rolls off the tongue? Go ahead say it really fast three times over. After the initial felling, the main trunk is broken down into smaller sections known as rounds, using the Stihl Farm Boss, which I referenced in an earlier post. 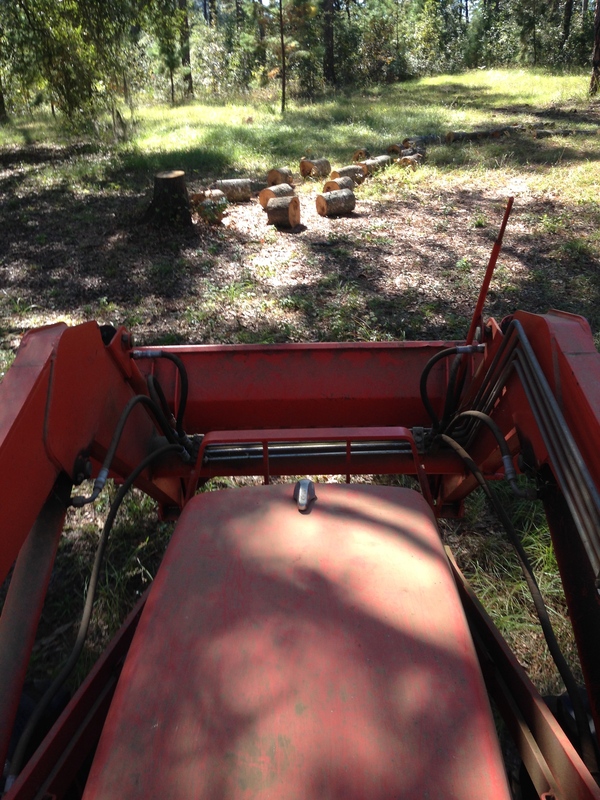 I tractor up and use my front end loader to move the rounds from the tree site to the well house shed where I can split the wood. Now, I used to split wood using wedges, hatchets, axes, and mallets, but that was before my enlightenment. 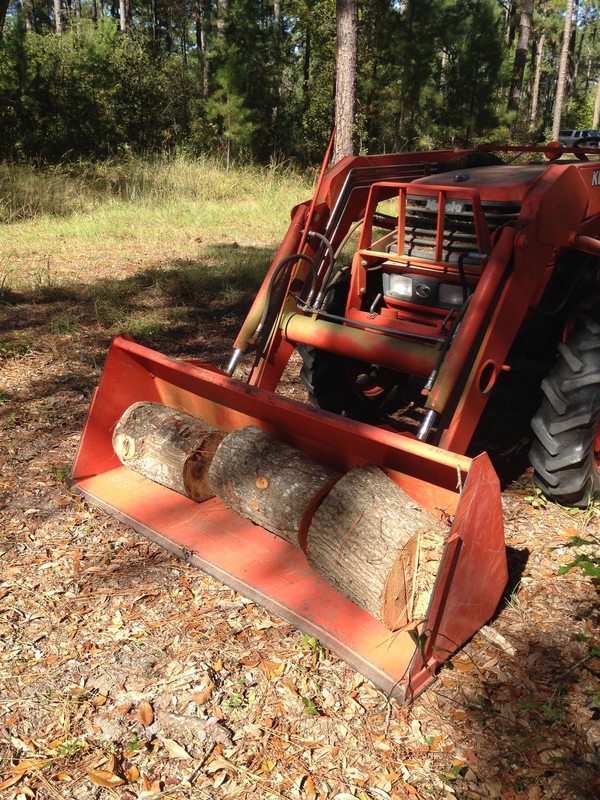 At the shed, out comes one of my favorite boy toys, the Troy-Bilt 27-ton hydraulic log splitter, and a complete exercise in brute power,strength, and dominance. From there it is just what you would expect. 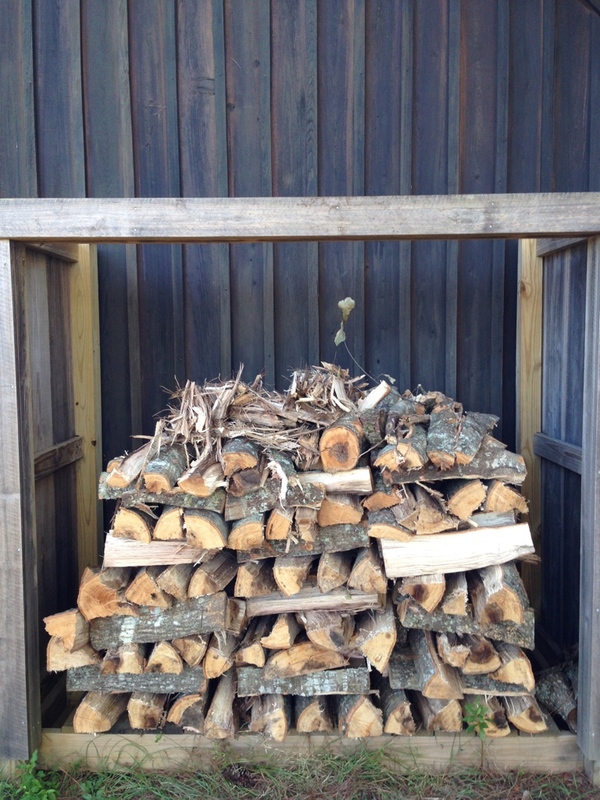 Stack the wood. You have all the best toys. I don’t like using a chainsaw though-so little margin for error, same reason I don’t like motorcycles. Bought a nice little one for Mr. Bebe though. Chainsaw I mean, not motorcycle. We are bothered about the stumps. What does one do? I am sure that Mr. B – will absolutely love his new Christmas present, what red-blooded American man would not? The key of course is to have the proper respect from knowing that the instrument can maim or kill you; once you get that, let her rip. We left that particular stump as a horse mount. 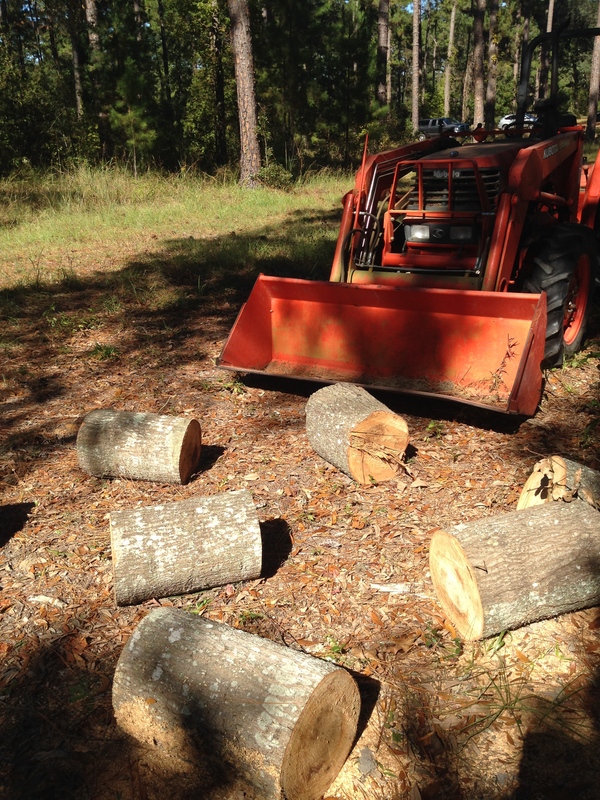 Regarding stumps, the stump grinder is yet another fun power invention and a tool every well -equipped farmer should have. Does that sound too odd? Now, here at Totem Hall I will set a fire anytime the thermometer dips below 50. This morning, at the start of farm chores, the reading was 29, not Bebe cold, but plenty cold for this old hillbilly. I do envy your toys GF! I’d take that Front End Loader into town every morning to get the paper and make ‘Stihl Farm Boss’ an overworked part of my vocabulary. I’m with Bebe, if it’s only 50 then you’re just posing! Ha, thank you so much for the great idea. Now that we are in the season of parties, I plan to make Stihl Farm Boss a completely overworked phrase, dependent, of course, on whom I am talking. Interesting you should mention driving the Kubota into town. I have a piece of land that will eventually go commercial office/retail. 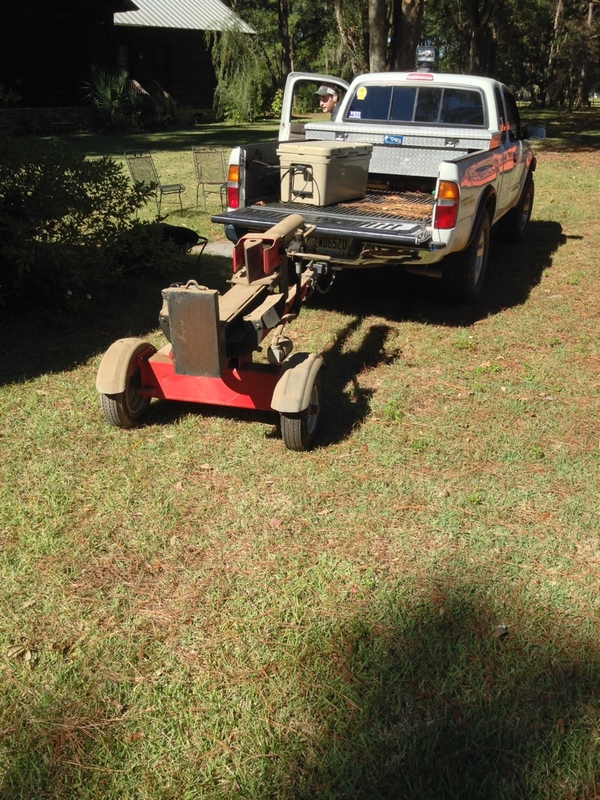 Until then, I have toyed with the idea of running an urban farm, which would entail commuting with the Kubota. That is alot of hard work my friend. Never did any of this, except to build a fire in a pit at my friends campsite in the Pocono Mountains. I am guessing the fire smells wonderful with a glass of nice red wine or a whiskey bourbon??? 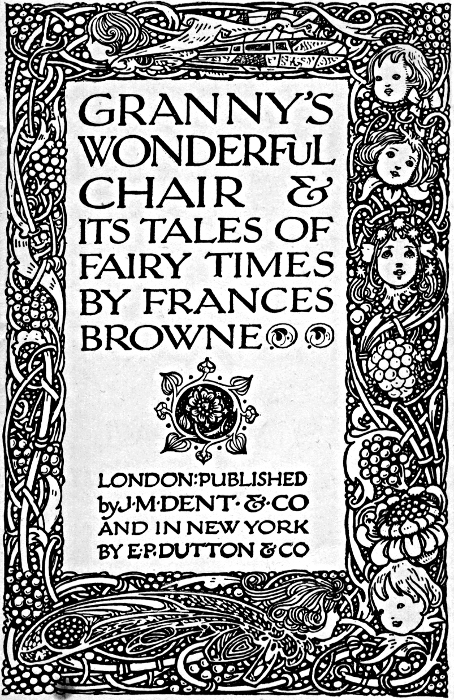 I am in love with that fun fire screen. 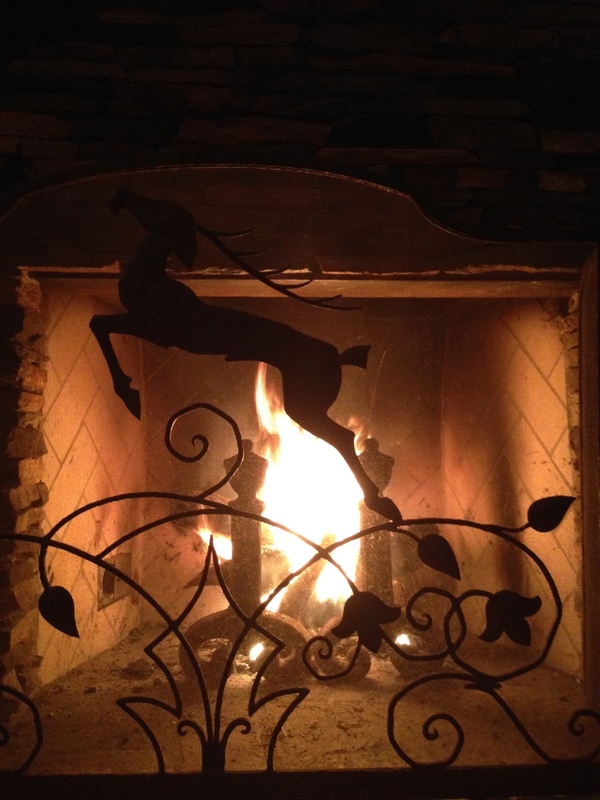 Fires do smell lovely, particularly when enhanced by wine or whiskey. Here the air is rarely cold and crisp, but on those occasions, to step outside and take in that smoky chimney drift, well, gosh, I am not sure if there is anything better. Do not discount fire building in the Poconos. How many of us can claim that? ps. I’ve built out of 100 year old tiles and firebricks (from a German stove) a tile stove. It is amazing !!!!!!! I love the idea that you built a stove from tiles that are over 100 years in age. That is simply amazing. Please, please post a story on your stove! Electricity is not cheap here, but it is our primary source of heat. I have daydreams of going solar, perhaps powering the kitchen that way, just in case we have a hurricane and the main power goes out. How right you are on the front-end loader. It is so true! My latest use for the front-end is as a box grader, an implement I do not yet have, simply flip it over, and scrape. Fires are the most elemental and perfect to enjoy life’s blessings. I envy anyone connected to the land. Lots of work but how very satisfying! Ahhh – I love the end result. As most things in life, anything worthwhile is worth the work to get it. Oh, and the end result of this particular work project, warm and cozy evenings in front of the fireplace, snuggled up against the elements, is not too shabby! and if He pleases, I may get a few more. redline hits 40 things get comfortable..